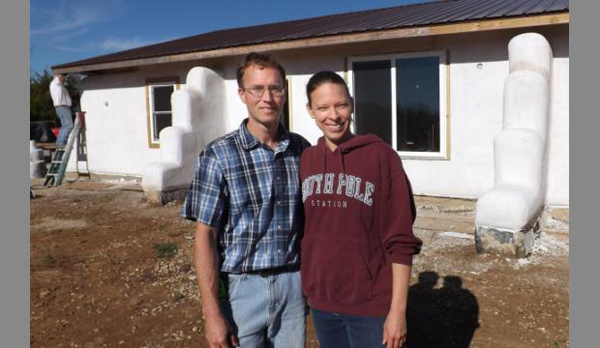 Keith and Lily Fouts stand in front of the earthbag house they are building for Keith’s parents in eastern Kansas. “RURAL OSAGE COUNTY — When Keith Fouts was a child and camped with his grandparents on their Lake Pomona lot, he would play on a nearby stretch of property and dream of one day owning it. In 2010, he purchased the 7 ½-acre tract, and now he and his wife, Lily, are building an earthbag home there for his parents, Lee and Ann Fouts. “I developed an interest in taking care of the environment and solar and renewable energy programs, but for this project, my parents were retiring and needing a smaller house. They had a big house in Ottawa … and they needed to lower their utility costs for their retirement income,” said Keith, a journeyman/master electrician with a degree in aeronautical science from Florida Institute of Technology who works on commercial and industrial projects. 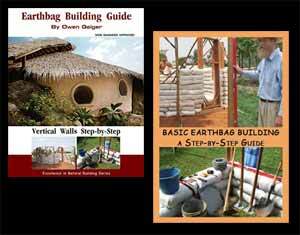 Two years ago, the Foutses began building the earthbag home, while researching online, reading “Earthbag Building” and attending the 2014 Natural Building Extravaganza in North Carolina to get ideas and hone their skills. The earthbag house is constructed mostly of tarp-like, tie-string sandbags filled with a mixture of clay harvested from on-site and rock screenings from a nearby quarry. The bags are stacked to form the structure; insulated with papercrete, made mainly of newspaper and cement with borax to discourage insects and prevent mold and mildew; strengthened and stabilized by galvanized barbed wire; and covered with lime plaster. The couple stacked about 4,000 100-pound sandbags to form the 21-inch-thick walls of the structure. The bottom row sits on a layer of gravel, which keeps the other bags dry by preventing moisture from moving upward. “We do a row of bags at a time, and then tamp down the whole row,” Keith said. The earthbag home features a mudroom with washer and dryer; kitchen; dining room; living room with cathedral ceiling; master bedroom and bath; guest bedroom; bedroom/office; earthen floor with radiant heating; screened-in porch; multiple south-facing windows; thresholds made of concrete; and separate utility room with a 3,000-gallon rainwater cistern and an elaborate filtering system. The Foutses subcontracted some of the work for the home, which brought its price tag up to $100,000.